Added on March 11, 2015 by Jeanne Greco. When you are asked to design a stamp, you think it would be nice to be able to capture the essence of the subject without too many "bells and whistles,” as is true in any design development. In this instance, to design a stamp destined to grace the envelopes of a wedding invitation, the style requires an elegance; the subject requires something ubiquitous enough to relate to all the many weddings without being too specific. A simple flower came to mind. One that had been beautifully engraved in an historical book about nature was the solution. I had been interested in a collection of engravings called Erucarum Ortus, the full name: "The Miraculous Transformation and Unusual Flower-Food of Caterpillars” by German artist and naturalist, Maria Sibylla Merian. A year before the design of this stamp, we acquired a country house in the Hudson Valley. I found myself literally sitting on the ground, sifting through soil, contemplating the variety and wonder of nature, and most specifically, the insect world. This book, to me, is a celebration of all things small and alive and possibly found in your backyard. It was this recent fascination with entomology and my admiration for the detail and beauty with which the engravings were rendered that inspired me to bring these images to stamps. They have a timeless quality. These botanicals are over 300 years old. Portrait of Maria Sibyllan Merian from a 500DM banknote. I removed the insects from the images so that they would be more appropriate as wedding stamps. In a note to my art director, Greg Breeding “I think it is best to reserve the birds and bees for a later love stamp." Of course, I would like to say that this design was my one and only vision for these stamps. But as with other design projects, I feel compelled to flush out all the ideas that could call themselves "wedding stamps." I did begin designs with wedding rings, ampersands, brides and grooms, for instance, but they fell to the wayside. The simple flower had a universality that the others did not. After all, a USPS stamp is to be used by millions. The challenge is to bring something fresh to an already well-used stamp image: the flower. The depiction of a flower that had already been translated to a graceful black and white line seemed the solution. A simple crop of the image and addition of a crimson heart was all that was needed. It is a departure from the usual colorful or photographed flowers that are normally used. My forte, as a designer, actually lies in the use of the letterform. I designed a Barbie® logo at one point in my career. However, I have designed four USPS stamps (two sets of two) and I have not yet focused on type in any of these. Ten years ago, the Postal Service initially had asked me to do a stamp using type or lettering. It was to be a love stamp with the word “Love" in all the most popular languages in the United States. (Who knew Tagalog is the 3rd most popular language spoken in the U.S.?) The resulting stamp designs were left unused because of a debate over which languages were to be included and which to be excluded. You have to realize there is not a lot of room on those little stamps, so you have to be succinct. This stamp project actually transitioned into my designing of the 2009 release “se tenant” stamps of the King & Queen of Hearts. I am thinking, though, that my next stamp design should concentrate on some form of type or hand-lettering. 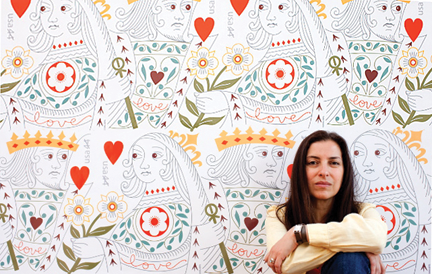 Portrait of Jeanne Greco, photographed by Jean-Luc Fievet, in front of a wall enlargement of the 2009 USPS Love Stamp, The King and Queen of Hearts. I hope that I have brought something new to the world of stamp design. Although I realize that what I have done is to bring back what is old in such a way that it is new. A designer is someone who can do that. But it is not limited to us. I worked many years for Francis Ford Coppola designing wine labels and the like. He used to say: “The people want authenticity.” By using the traditional flower engravings by Maria Sibylla Merian for a modern postal stamp, I brought to the foreground an authentic beauty and genius of a woman who was before her time.